We are very excited to announce (and launch) our brand new website! 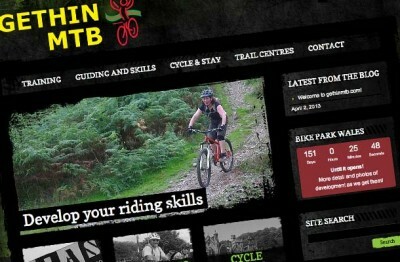 Gethin MTB is a new venture run by Aeden O’Neill, a man with vast experience in setting up and running every conceivable type of cycling club or venture from National Standards cycle training and Saturday Morning Bike Clubs all the way through to fully-fledged MIAS Instructor training and Cycle FIT maintenance courses. With close links being forged with the exciting new BikePark Wales project, as well as contacts throughout the mountain biking community, Gethin MTB already has a reputation for excellence and the word is spreading quickly! Hand-in-hand with the launch of this site comes the announcement of Cycle & Stay, an exciting new partnership with local B&Bs, guesthouses and hotels, aiming to provide easy booking of both accommodation and bike hire, guides or skills tuition. So take a look around our site and then get in touch with us by calling 07988 760 720 or dropping us an e-mail.